The news this week has been dominated by trade war talks and OPEC’s suggestion of increased production, with WTI and Brent reflecting the market’s confusion. Oil prices were a mixed bag this week, with Brent holding steady but WTI declining on higher U.S. output. 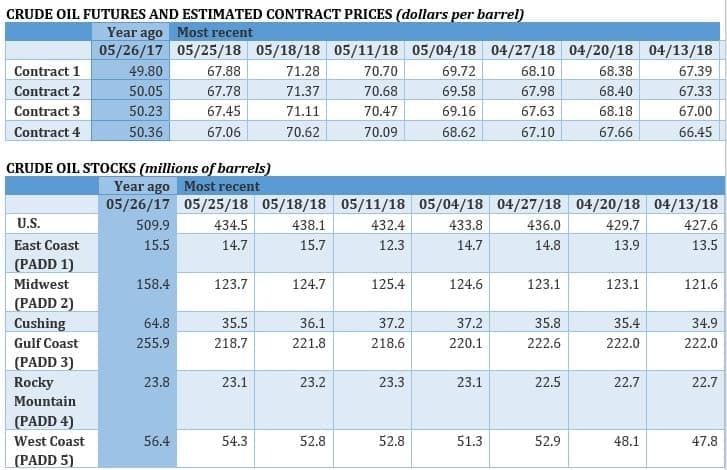 The spread between the two benchmarks is rare, and reflects uncertainty and confusion in the oil market, as well as regional differences in supply and demand. U.S. tariffs threaten financial markets. President Trump resumed this trade war this week, slapping steel and aluminum tariffs on Canada, Mexico and the EU and industrial tariffs on China. The decision comes after offering exemptions to U.S. trading partners in recent months, and comments from the Treasury Secretary just last week that the trade war would be “put on hold.” The about-face has spooked financial markets. 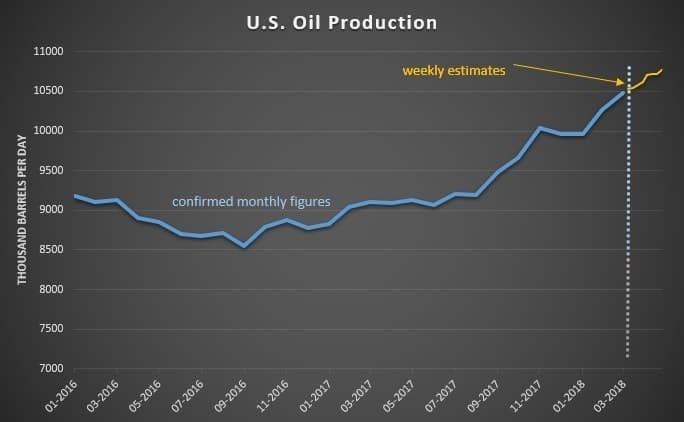 As for oil, a trade war threatens to undermine demand, although the magnitude of the slowdown is hard to predict. WTI blowout. WTI dropped to a more than $10-per-barrel discount to Brent this week, the widest spread in three years. The pipeline bottlenecks in the Permian are starting to bite. “This was inevitable. There was way too much production growth for infrastructure to handle,” Vikas Dwivedi, global oil and gas strategist at Macquarie, told Reuters. Meanwhile, the uncertainty surrounding the OPEC deal, plus geopolitical risk, has Brent looking for direction. “The market doesn’t know where the price of oil is going to be and probably doesn’t know where it should be, and so it’s open to some major price fluctuations,” Richard Hastings, an independent analyst, told Reuters. U.S. exports of crude are rising, while Brent-linked cargoes in the Atlantic Basin are struggling to find buyers. PDVSA steps up fuel imports. Venezuela’s oil industry continues to fall apart. Reuters reports that PDVSA put out a tender to purchase 900,000 barrels of high sulfur diesel, heavy naptha for refinery processing and propane. It is also offering to sell 500,000 barrels of fuel oil. 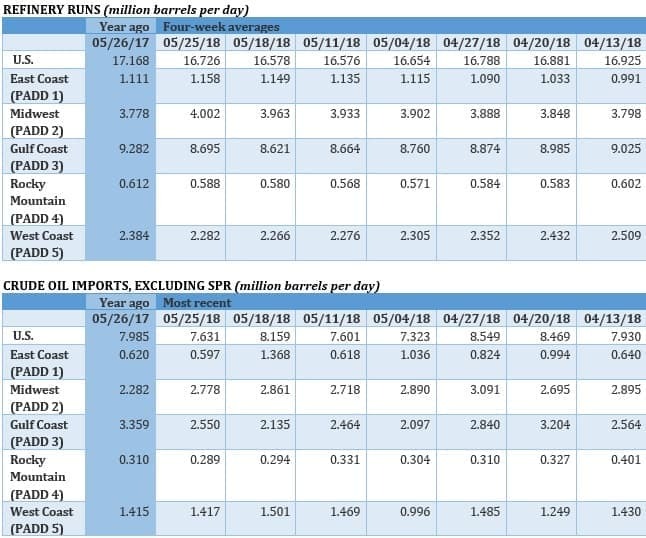 Venezuela’s imports have jumped over the past year as its refining capacity has withered. PDVSA’s refineries operated at just 31 percent capacity in the first quarter. Mexico’s pipeline delays could cap Permian gas. Argus Media reports that delays for a series of pipelines in Mexico will limit the volume of natural gas that it can import from Texas. 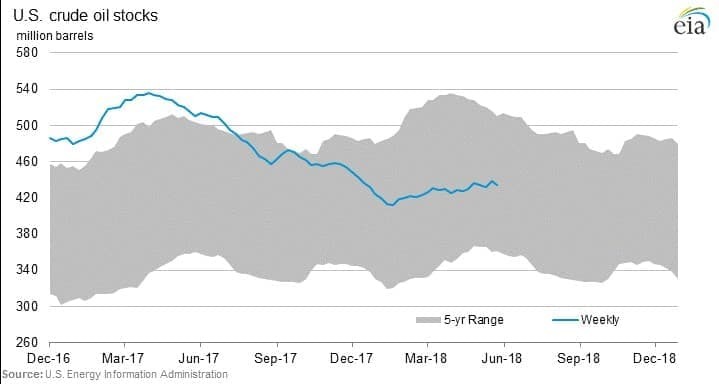 That, in turn, could cap the amount of gas flowing from the Permian, which has been increasing at a rapid pace over the past year. International companies gain interest in Azerbaijan. At a conference in Baku, Equinor (NYSE: EQNR) (formerly Statoil), signed agreements on new oil projects in Azerbaijan, according to S&P Global Platts. BP (NYSE: BP) also boasted about its new contract in Azerbaijan, signed in April. S&P Global Platts says that interest in Azerbaijan is rising, and the partners running the massive Kashagan oil field are also considering expanding the project. Trump to throw emergency lifeline to money-losing coal and nuclear. Bloomberg reports that the Energy Department has prepared a draft proposal that calls for using emergency authority to direct grid operators to buy electricity from “at-risk” coal and nuclear plants. “Federal action is necessary to stop the further premature retirements of fuel-secure generation capacity,” says a 41-page draft memo circulated before a National Security Council meeting on the subject Friday. Petronas to buy 25 percent stake in LNG Canada. Malaysia’s Petronas announced a decision to take a 25 percent stake in the LNG Canada project in Kitimat, British Columbia, for an undisclosed sum. The move comes less than a year after Petronas pulled the plug on its own $36 billion LNG project in the province. The investment is a major signal that sentiment in global LNG markets has shifted. Over the last few years, the market for LNG looked like it would be oversupplied for years. Suddenly, the market looks a lot tighter, and interest in new LNG export projects is rising again. Warren Buffett utility to be first to 100 percent renewable energy. MidAmerican Energy Co., owned by Warren Buffet’s Berkshire Hathaway, is set to become the first major U.S. utility generating enough electricity from renewable energy to meet 100 percent of its customer’s usage. MidAmerican will complete a 591-MW wind project, the company’s 12th, by 2020, which will allow it to meet that renewable target. U.S. Transportation Department proposes watered-down fuel efficiency standards after 2020. The Transportation Department sent a proposal to the White House this week that would no longer require automakers to increase fuel efficiency after 2020. Crucially, it would also take away California’s authority to set its own fuel efficiency standards. The proposal could be released next week. U.S. 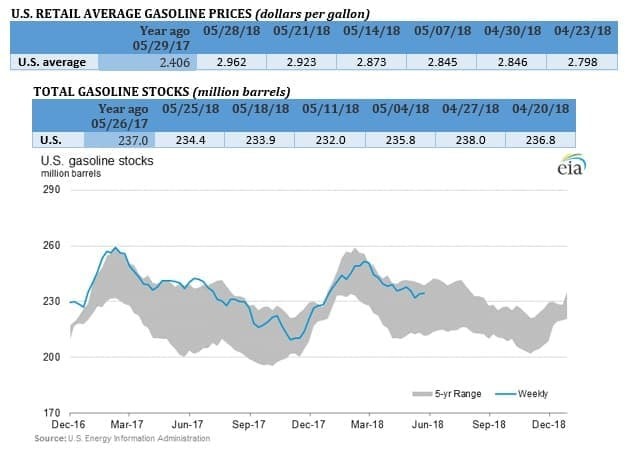 Senator Tom Carper (D-DE) said the revisions would result in the U.S. burning through an additional 206 billion gallons of gasoline through 2050. GE backs out of Iran. GE (NYSE: GE) will end sales of oil and natural gas equipment in Iran later this year, the latest sign that pending U.S. sanctions are having a serious impact. GE had received contracts from Iran for tens of millions of dollars for oil and gas equipment since 2017. For Iran, the withdrawal is a problem because the gear and equipment are crucial to maintaining and growing oil and gas production. $1 billion in EV recharging infrastructure this week. California announced a $738 million investment in electric vehicles this week, which will inject money into EV programs for utilities, offering customers rebates on the installation for recharging stations, money for fast charging stations, and for recharging infrastructure for buses, trucks and forklifts. According to Bloomberg New Energy Finance, the investment will be the largest of its kind in the U.S. Meanwhile, in New York, the state announced a $250 million investment in fast charging EV infrastructure along interstate corridors. Together, California and New York just injected $1 billion into recharging infrastructure this week. Shell starts Gulf of Mexico project year ahead of schedule. Royal Dutch Shell (NYSE: RDS.A) started up the Kaikias oil field in the Gulf of Mexico this week, one year ahead of schedule. "Shell has reduced costs by around 30% at this deep-water project since taking the investment decision in early 2017, lowering the forward-looking, break-even price to less than $30 per barrel of oil," the company says in a statement. The project will have peak daily output of 40,000 bpd. Why Aren’t Permian Oil Producers Profitable?